In a striking symbol of the suspicion for multilateral forums shown by the adminstration of US President Donald Trump, Pompeo snubbed the event in the northern resort of Dinard presided over by French Foreign Minister Jean-Yves Le Drian. 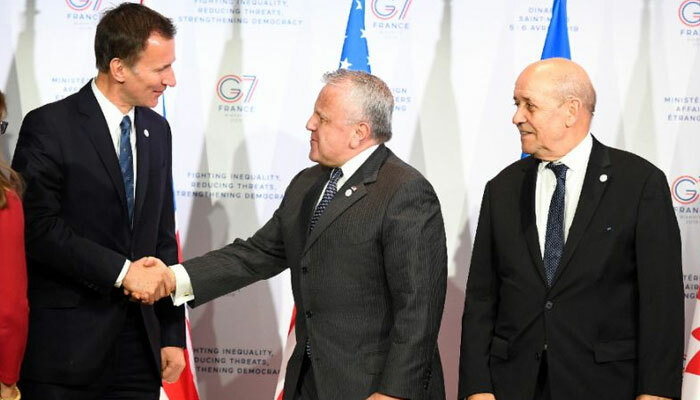 Instead, Pompeo´s deputy John J. Sullivan attended the meeting that aims to set a platform for a summit of Group of Seven (G7) leaders -- presumably including Trump -- hosted by French President Emmanuel Macron in Biarritz in late August. Putting a brave face on both the high-profile US absentee and also the rainy weather, Le Drian told the ministers that the priorities of the French presidency of the G7 were battling inequality and strengthening democracy. "There is a proverb in France that a ´rainy marriage is a happy marriage´ so I will say that a ´rainy G7 is a happy G7´," he said to laughter. Russia was slung out of what used to the G8 in 2014 over its annexation of Crimea from Ukraine and Le Drian urged stronger action against alleged Russian meddling in Western elections. The ministers should look at "ways to reinforce our democracies in the light of the digital revolution and the development of practices of interference." British Foreign Secretary Jeremy Hunt said the ministers would try to agree on a "deterrence strategy" to warn off foreign states such as Russia from meddling abroad. "We are getting much better at fending off these attacks. What we don´t do at the moment is deter them," he added. Pompeo was conspicuous in his absence at the French gathering, although most of the ministers had been able to talk with him at a NATO meeting earlier this week. "I think we all regret that Mike is not here with us, but his very able deputy is here with us," said Canadian Foreign Minister Chrystia Freeland. She also echoed her French counterpart´s concerns over election meddling, saying interference in Canada´s upcoming parliamentary election due by October was "very likely". "We think there have probably already been efforts by malign foreign actors to disrupt our democracy," she said. German Foreign Minister Heiko Maas said he was confident that the United States, which is due to take over the presidency in 2020 after France, would remain a key player in the G7. "We were able to speak very intensively in the last days (at the NATO meeting) so I think we can get over it," he said of Pompeo´s absence. The meeting was also taking place against the background of a litany of global troubles ranging from Libya to Britain´s exit from the European Union. Hours before the meeting began, British Prime Minister Theresa May asked for a new delay for Brexit to June 30, a request met with only the most lukewarm of responses from European ministers including Maas. "It is a difficult situation. There are I think many questions still to clarify in London," he said. Macron is hoping that the G7 presidency and Biarritz summit with burnish his status as a global statesman tarnished by months of street protests in France. The G7 was founded in the 1970s under the presidency of former French president Valery Giscard d´Estaing, but analysts say its clout may have dwindled with the creation of the G20 in the late 1990s. In the absence of Pompeo, one of the most prominent personalities present in Dinard was top human rights lawyer Amal Clooney who was named special envoy for media freedom by the British government.